Last session of the match, Selby leads Hendry 12-4. Selby uses only 11 minutes to beat Hendry 13-4. Selby faces Ding Junhui/Stuart Bingham in QF. Before the match, many people was talking about if Hendry would retired after he lost. ( For futher details please refer to my article: End of the career for Stephen Hendry? ) And the answer is NO. Hendry admitted he longer enjoys playing snooke after the match but he would decide his future in the summer. Hendry has not yet made up his mind about retirement at the moment, fans of Hendry can relieve for a while. They played two long and slow sessions, Higgins holds a 10-5 lead over McLeod. After the session begins, Higgins takes the first two with 51, 72 before McLeod pulls two back. McLeod drags Higgins to play after mid session, he is 7-12 down on Higgins. Higgins struggules in the 20th frame but he wins on the final black. John Higgins beat Rory McLeod 13-7 in nearly 8.5 hours. He faces Ronnie O'Sullivan/Shaun Murphy in QF. Another exciting match it will be. Bingham takes two frames advantage over Ding, leading 9-7 before last session starts.Ding takes the opening frame, he is only one frame behind Bingham, 8-9. Bingham leads 11-8 with 101, Stuart looks very good at the moment. Ding goes 9-11 before mid session, not too bad for the Chinese Hero. The Ballrun extends his lead to 12-9 with 134, his second century in the session. 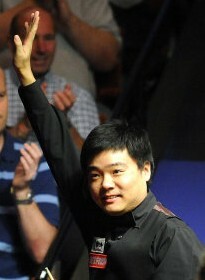 Ding Junhui keep himself stays in the competition, nicks another one with 92. There is some drama in the 24th frame, Bingham is unlucky to have whiteball off twice. Ding forces a decider from 9-12 down. In the decider, we see some brilliant snooker and snooker escapes, Ding eventually wins it 13-12. Congrats for Ding reaching the QF of WC in his career for the first time - a breakthrough! 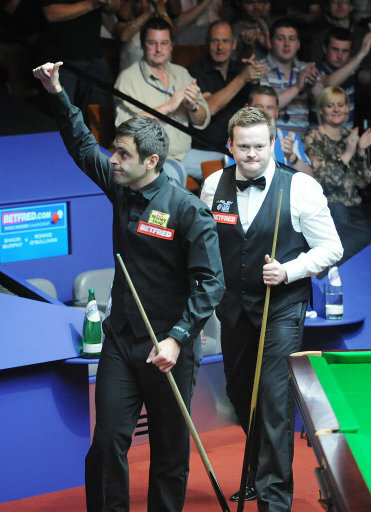 O'Sullivan did not do well yesterday but still leads Murphy 9-7 before last session kicks off. Ronnie takes the scrappy opening frame of the session, 10-7 up on Murphy. Ronnie knocks 128, the first century in the match to hold a four frames advantage. Murphy pulls one back, a very important frame to trail 8-11. The Rocket is fired and 119 put him 12-8 ahead of Murphy before mid session. Murphy survives and wins two frames before Ronnie ends the match with a break of 71. The Rocket meets John Higgins in QF! A Cracking match! Please subscribe the feed if you like my posts :) Your support will be my motivation! Welcome to leave comments on my blog :) Just click the link of posts and write in the comment box! 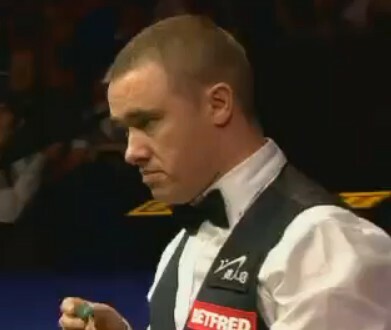 End of the career for Stephen Hendry? Are You Ready For the 17-day Marathon? ©Snooker Baize 2011. Picture Window theme. Powered by Blogger.